Traditional school tables built to last for generations. Available in six heights. Easy-to-clean laminated top available in white or natural. Baltic Birch school furniture of the highest quality, made in the USA with environmental sensitivity, using a cleanable, non-toxic finish that will not yellow. Tables ship fully assembled and include a lifetime factory warranty. 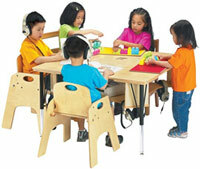 Scroll down to view entire selection of multi-purpose school tables. Also available with white laminated top. Traditional, solid hardwood chairs. Available in six sizes.